The Angell K7 Red is something completely new from Angell Tennis – 98 sq inch frame that is not a part of the Angell Custom program, but tailored towards a broader audience. This is the Angell K7 Red racquet review. 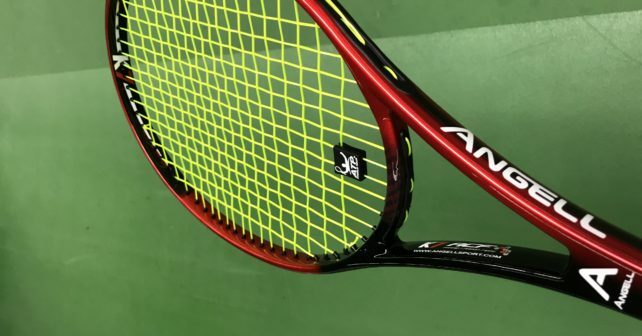 If we look at the specs of the Angell K7 Red we can see that they are quite close to a Yonex Ezone 98 , or a Wilson Blade 98 or a Babolat Pure Strike 98 , but there is one outstanding factor here that really makes a difference and that is the pronounced flex of the Angell K7 Red. This flex contributes to a lovely feel that really made this an extremely enjoyable Angell K7 Red racquet review. Check out the Angell K7 Red and other Angell tennis racquets here. With an RA of 64 unstrung (becomes something like 61 RA strung, but has been measured as even lower), you really get something quite unique in the market place, a modern racquet with old school flex. All other Angell tennis custom frames (such as the Angell TC 97 Custom) have been foam filled for a more comfortable and solid feel, but the K7 Red is built with a mix of aramid and carbon fibre which makes a stable yet remarkably comfortable racquet. Not everyone wants a flexible tennis racquet however, in the contrary, a lot of players prefer the direct feedback and crisp nature of stiffer frames. Let’s say you’re loving the raw power feel of a Babolat Pure Drive (read my review here), then the Angell K7 Red is likely not for you. 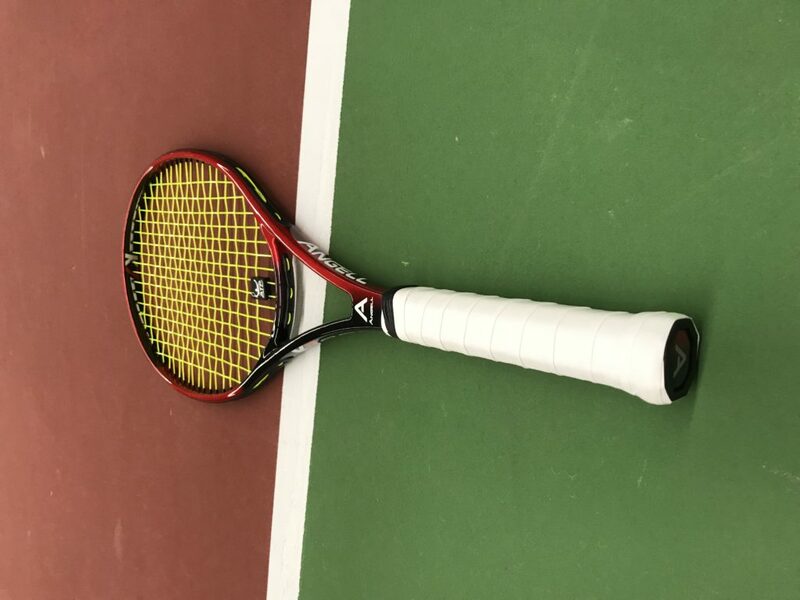 But if you’re a player that enjoys plush player frames but want to try something with a lower static weight, then this racquet could be your next best friend! The weight of 305 grams unstrung is not a lot for a players’ racquet but gives you the chance to add lead tape to find your ideal spec. I’ve been playing around quite a bit with lead and think it plays great with strips at 3 and 9 (and a little on the handle) and a total weight of around 335 grams strung with over grip. The Angell K7 Red is really a more control-oriented modern racquet. With the right string you really feel like you can attack the lines and go for your shots with confidence. I really like hitting aggressively with it on both wings and never felt that I had to hold back on my swings. The launch angle is thankfully low and the string bed response consistent with the right string. I wouldn’t say that the Angell K7 Red is a very low-powered racquet. With its open string pattern and large sweet spot it still can bring some heat to the ball. Comparing it to the Pure Strike and Blade 98, I would say it has a little less power however. I would never have expected the Angell K7 Red to be such a spin racquet, but the more than standard open string pattern really creates massive RPMs on the ball without having a high launch angle. The extra spin really helps when you go for your shots, but it does eat strings so I’d recommend going with something more durable in this racquet. Even a stiff poly string such as the Volkl Cyclone or Luxilon Alu Power will be relatively comfortable in this racquet. The standout feature of the Angell K7 Red is really the comfort. It’s probably the most comfortable modern racquet I have ever hit with. Not sure if it’s the construction of Aramid and Carbon fibre or just the low RA of 64, but it really is a good choice if you have sensitive arms. The pronounced flex of the Angell K7 Red really creates the feeling that you can place the ball wherever you want. I loved it for drop shots and quirky slice shots, but struggled a little bit with on volleys. I guess it because I’m more used to a heavier, slightly stiffer racquet with a tight string pattern where the response will be stable and ultra predictable. But once I figured it out the ideal lead tape placement for me, it wasn’t hard to get it dialled in. Still, it’s not my favourite racquet for serve-and-volley tennis. As you might have guessed, I have pretty much only positive things to say about this racquet from Angell. It’s so refreshing to play with a modern racquet that is as flexible as this one. And it’s not low-powered by any means! I found myself hitting plenty of winners with the racquet with the ball just dipping in a couple of inches from the line and the feeling that I can stay on the gas and play aggressively, is definitely a winner with me. I’ve been playing with this racquet for quite a while now and could happily take it into a tournament. I might even be switching to it, but I still have a few interesting play-tests coming up before I can make that kind of commitment. No matter what, this is a brilliant racquet and something of a must try if you’re open to racquets that can flex! Buy your K7 Red or Angell custom tennis racquet here. Are you tired of me writing and talking about this racquet now? Or do you have more questions? Please comment below! thx for your Review. Good Work! At this Moment i am searching for a good Set UP Too! The Grip is thicker! So did you replaced it? Which String do you prefer at this Moment? I have some Sets coming away, with round Polys. Kirschbaum Max Power, Wilson Revolve, Rs Lyon. I dont know, but coming from 18/20, with a shaped Poly it has really a higher Launch Angle. Btw, you cant write me an E Mail for Communication if you want! Hi, thanks for those useful reviews. Always very appreciated. However, I never read any reviews of Volkl racquets. I am wrong ? I have chronic elbow issues, so I threw away my old Pure Drive, and bought last summer a Wilson Blade 98s with Wilson Sensation at low 50s. Lot better for my arm… But I heard a lot of good comments and arm friendliness of Volk sticks. Just bought a used Organix 10 few days ago, but didn’t try until now. Long winters over here…Do you have any suggestion about them ? Thanks! Thanks! You are definitely not wrong. Long time since I used a Volkl racquet, I used to be a fan of the Powerbridge 10 Mid so it’s a bit overdue. Volkl sticks used to be arm-friendly, not so sure these days as stiffness ratings go up. Which Organix did you buy? Will reach out to Volkl and see if they have any interesting new models that need reviewing! I got dialled in with the Volkl Cyclone after a while, but now I’m going to try a natural gut hybrid and also my favourite string Solinco Hyper-G in it to see what works best. How is the flex and power level comparing to TC97 and Head IG Radical PRO(this one has a very distinct type of flex) ? P.S. I see you enjoy close patterns and 95 sq inch but you did not try the AngellTC95 18×20 yet, I have one I can lend you for a review, drop me an email if you are intrested. The flex is more pronounced on the Angell K7. You either like or you don’t I guess. It seems to suit my game pretty well however! I would say the IG Radical Pro is more powerful and I didn’t find it to have the same kind of flexy feel as the K7, I had a hard time controlling that racquet in a match situation although I really liked it. The TC 97 power level is slightly higher I would say. At least in the 18×20 one. You feel the sweet spot really feel in the TC 97, but the the sweet spot is bigger in the K7 Red. Really nice of you to lend me one for a review. Let’s see if we can work something out! Hi, my Volkl is the Organix 295. I think the 325 version would be too much for me! And stringed with Babolat VS Natural Gut was very tempting to buy it! Gonna try it this WE. However, I read very good reviews in TW about the Volkl V1 Super G… Yes, maybe the actual V Sense line is a little bit on the more stiffer side now, I don’t know. For sure, the K7 Red seems very a interesting option for me ! Wondering, in your opinion, which frame would have a better comfort rating than the K7? The K7 makes my Head MG Radical feel harsh by comparison. I think I haven’t hit with anything as comfortable since the Dunlop Max 200g. You have to do a review of TC95 16×19. I have one and I’m sure you’ll like it. I have a TC97 16×19 too, but the TC95 is far superior in my opinion. I think it’s superior because in relation to TC97, the TC95 gives me much more precision, rotation, power and aggressiveness in the blows. My TC95 is 310 grams (unstrung) 16×19, 63 RA and 9HL. It’s worth the test of that version. I got my Angell K7 today. The night I will test and compare with my TC95 16×19 and 63 RA. I have high expectations for K7. Yesterday I played with the K7 + luxilon Alu power. I found the K7 very similar to the TC95 16×19 63 RA, but I found the K7 much more comfortable, a better feel. But I found it more unstable in balls out of the sweetspot compared to TC95. I have not added lead yet, but I think adding it solves that instability. Thanks Jonas and everyone who has commented. I have finally made a decision and bought a K7 Red. Looking forward to playing with it! How many grams of lead did you add? I received a K7 16×19 for Christmas and have been getting acquainted with it. Its beam is thicker than I expected, and the more open pattern of 16×19 is an adjustment from what I’m used to, as my other racquets are 18×20. I added weighted tape to the handle and strung it tighter than I usually do at 54 Lbs (normally around 50 Lbs). Also needed to use deader string. It’s great for depth of shots and baseline rallying, though unfortunately less predictable up at net. The closest comparison I have is the Yonex ezone DR 98 but more wrist friendly. Wish Angell Tennis had come out with the 18×20 earlier. I’ll be interested to read the Tennisnerd comparison of K7s.